The Ace Attorney Trilogy complies the first three titles of the series into one glorious (and very high-definition) package. Phoenix Wright: Ace Attorney was first released in Japan in 2001, for the Game Boy Advance; it traveled west via a 2005 Nintendo DS port. The second title, Justice For All, was released in Japan for the GBA in 2002, with the western port again for the DS in 2007. 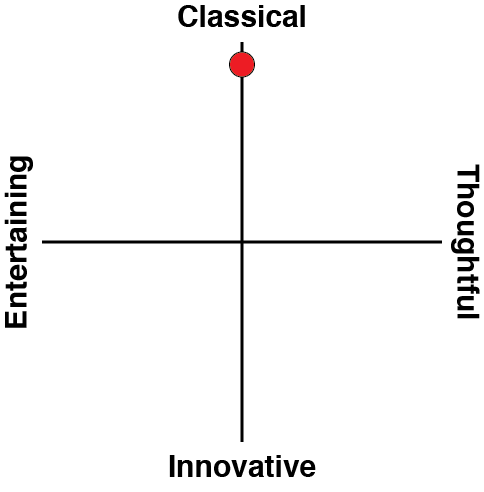 The third title, Trials and Tribulations, followed a similar pattern to the first two, releasing in the west in 2007 (North America) and 2008 (Europe). The three titles have also been released packaged together before, for mobile in 2012 and the Nintendo 3DS in 2015. Phew. Got through that history lesson for you. Looking back, I've owned both the individual titles and the trilogy... twice. Yet I still jumped at the opportunity to play again. 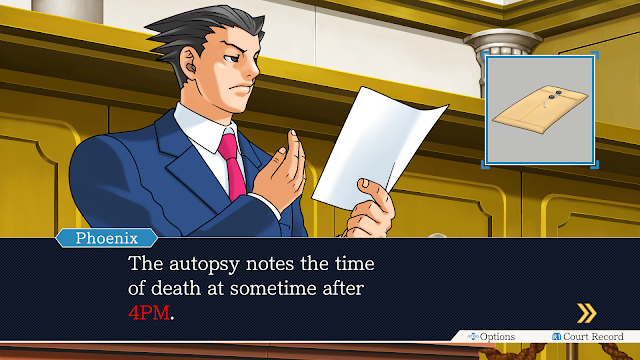 Ace Attorney is a masterpiece in the visual novel genre and always worth the revisit. For once, my poor memory is good for me, as after a few years the details have faded among new memories being made. Still, the love for Phoenix Wright remains. The series creator originally intended for it to remain a trilogy, which means this package is perfectly self-contained in the Ace Attorney world that has since expanded to other video games, video game spin-offs, a live film, manga, anime, and musicals/plays. There's a reason it's so popular, a reason I consistently turn to: the characters are everything. At first glance, though, I'm surprised how lovely and crisp the graphics are, considering the original titles launched for Game Boy Advance in Japan. The HD remake really pays off. 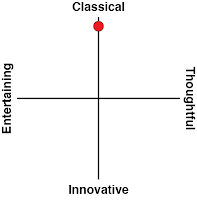 Gameplay is easy to pick up on and remains consistent across the titles in the Trilogy. There are five cases per title, so the trilogy includes 15 cases. Each case has two aspects, investigations and courtroom scenes. There is no jury; a judge alone decides each verdicts. 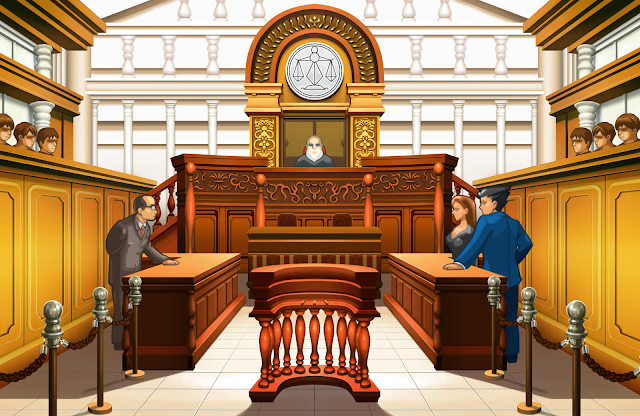 The exception to consistent gameplay is the psyche-lock introduced in the second game, when you bring up a topic a witness would rather avoid, and you have to break them by presenting evidence until they spill the beans. It's actually kind of fun, which makes me feel a bit evil. There is a wonderful rhythm to the courtroom proceedings, with all the "Objection!," "Take That!," and "Hold It!" Exclamations punctuating testimony. You make the call as to when to press a witness or when to present evidence, so it takes a keen eye to catch someone in a lie or pin the crime on someone other than your client. While the rhythm doesn't remain while investigating, searching for clues also requires brainpower. There's a lot of finding one clue, then having to find the perfect person in the perfect spot to get further. I prefer the courtroom, but that's just me — and I've always wanted to be a lawyer, not a cop, so it makes sense. Each game contains a cast of larger-than-life characters. 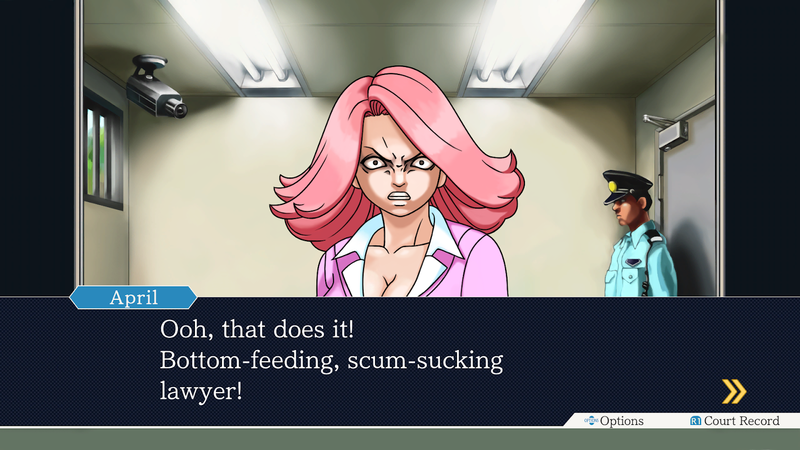 The protagonist across the board is Phoenix Wright, a rookie defensive attorney. His assistant, Maya, is a spiritual medium; she often channels her deceased sister and Pheonix's past assistant, Mia. The three titles each have a different (yet eerily similar in their arrogance) prosecutor. Miles Edgeworth appears in the first title as the main opponent, but also appears in later titles in some capacity. The second title features Franziska Von Karma, and the third, Godot. You know your adversary is worth it when they have only a single name. But really, it's the tertiary characters that make me laugh the most. Early on, Mia makes a joke (or "error") about Larry Butz, calling him Hairy Butz. 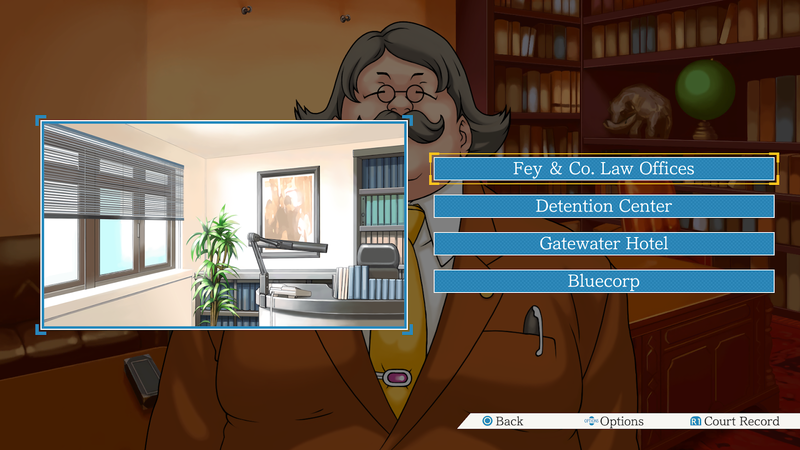 And it actually comes up in a later case, showing how everything ties together in the world of Phoenix Wright. But my absolute favourite witness across the three titles is Wendy Oldbag (say it out loud) in the first. She's an old security guard who loves to rave about yesteryear and rant about whippersnappers these days. She's like me, but fifty years older. It's like looking in an age-enhancing mirror. Each case is about as realistic as an episode of Law & Order. To go from the crime to case closed takes a whopping three days each time. However, those days are jam-packed, from courtroom procedures to crime scene investigations and detention centre interviews. Replace incompetent Detective Gumshoe with Jerry Orbach's Detective Briscoe, add a few well-placed dun-DUN chimes, and you'd pretty much be playing Law & Order: Japan. Except for some reason, the western localisations are set in a fictional North American city that just happens to be heavily inspired by Japan. Let's just call a spade a spade: the series takes place in Japan. Does the trilogy bring anything new to the table? Nah. It could try, maybe with an easy mode where your clients can't be found guilty, but there's little reason to. Having the titles on a large television screen is reason enough to play again. And again. And again. Also, I've taken a shocking number of meme-worthy screenshots, proving the series still has a place in contemporary video games despite being nearly 20 years old. Phoenix Wright was my introduction to visual novels, and these three titles hold a special place in my heart. This remake is well worth the play through for any fan of the series, or anyone interested in experiencing visual novels (without really knowing that's what you're doing, hilariously enough, because of all the action). The artwork and graphics really pop on a great television screen. The characters are whacky and wild, the crimes confounding, all in the best ways. However, before you play, a note: it will become habit to yell "Objection!" when you disagree with anything.